Home >>Random >>Does it annoy you when the customer changes the material type all of a sudden? Does it annoy you when the customer changes the material type all of a sudden? It does not annoy me anymore! 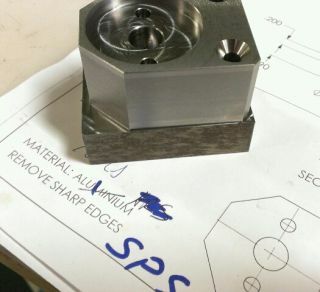 Originally this part was programmed for and machined in 6061 aluminum, but when production run came, material was changed to HRS and then to SPS (4140). Luckily reprogramming using HSMAdvisor hook for MasterCAM is a bliss. Mere 5 minutes and all speeds, feeds, depths of cut, etc. were changed to safe and productive values. New Comment to: Does it annoy you when the customer changes the material type all of a sudden?